If you ever wanted to debug your code(for your microcontroller) using printf() over UART in CooCox CoIDE then this tutorial will help you achieve that. In this tutorial we will see how to retarget printf() in CoIDE and send its output over UART to PC or Laptop to view the output in a serial console. This will work for most the ARM Microcontrollers supported by CooCox CoIDE like LPC176x, LPC134x, LPC111x, STM32F10x, etc.. Create your CoIDE project as usual. This will add printf.c under group stdio along with cmsis and cmsis_boot. Create and Add files: uart.c and uart.h to your Project. uart.c must contain the UART initialization code for your specific MCU along with a simple write() function that accepts a character as parameter and sends it over UART. uart.h must contain declarations for UART init and write functions. uart.h will be included in main.c, printf.c and uart.c. *           binary when using those methods, compared to the libc implementation. * @param  pStr	Storage string. * @param  c    Character to write. Inside main() function of your project, call uartWrite() to init UART so we can use retargetted printf(). After that you can use printf() as usual. Needless to say, you will need to include <stdio.h> wherever you want to use printf(). Note: The printf() code generated by CoIDE is “lite” or basic one in favour of faster code execution. It doesn’t support format specifiers for floats (%f), longs (%ld). However, you can add support for specifiers like %f by extending the code inside function vsnprintf(…). The list of supported specifiers is as follows: %d, %i, %u, %x, %X, %s and %c. Now, lets see some concrete examples of retargetting printf() using UART with source code. The following example uses a baud rate of 115200. //#define CARRIAGE_RETURN 0x0D //CR, For Windows Terminals (CR+LF). //Baud= ~115200. Now we can perform UART communication! Code for uart.h and edited printf.c is same as given in above section. CoIDE Printf Retarget Project for LPC1343 on GitHub @ Retarget printf in CooCox CoIDE , Download Project Zip. To retarget printf() for LPC1768 & LPC1769 microcontrollers in CooCox CoIDE, you will just need to modify uart.c file in the above example and replace the initUART() function with that for LPC176x. 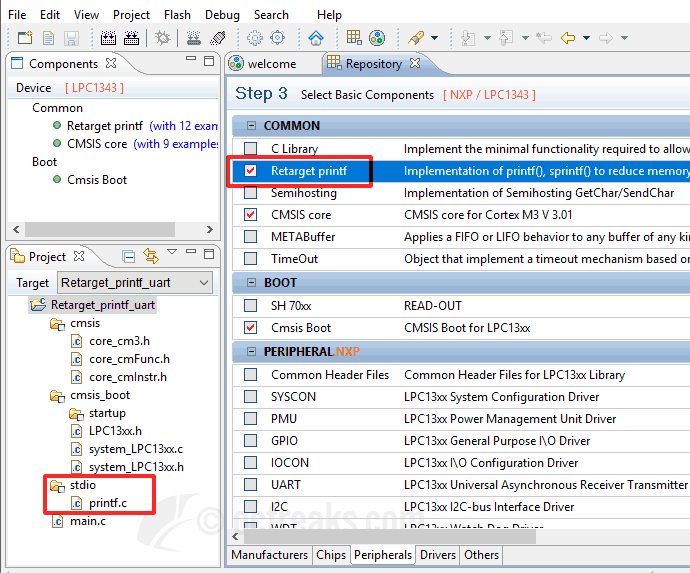 You can refer my previous LPC1768/LPC1769 UART Programming Tutorial for UART initialization function. I you face any problems please leave your comment below and I will try to help you out. If you want to Retarget printf() for LPC176x in KEIL then check my other tutorial : Retarget/Redirect printf() and scanf() to uart in KEIL.